TNF (Tumor Necrosis Factor), also known as TNFα, is a cytokine that can directly kill tumor cells without obvious cytotoxicity to normal cells and is a cell signaling protein involved in systemic inflammation and is one of the cytokines that make up the acute phase reaction. It is produced chiefly by activated macrophages, although it can be produced by many other cell types such as CD4+ lymphocytes, NK cells, neutrophils, mast cells, eosinophils, and neurons. TNF can bind two receptors, TNFR1 (TNF receptor type 1) and TNFR2 (TNF receptor type 2). TNFR1 is expressed in most tissues, and can be fully activated by both the membrane-bound and soluble trimeric forms of TNF, whereas TNFR2 is found typically in cells of the immune system, and respond to the membrane-bound form of the TNF homotrimer. As most information regarding TNF signaling is derived from TNFR1, the role of TNFR2 is likely underestimated. Upon binding, TNF triggers the activation of numerous pathways including the NFkB and MAPK pathway. As mentioned earlier, TNF exerts its function though binding to the two receptors, respectively. In contrast to TNFR1, TNFR2 diverts the tumor-inhibiting TNF into a tumor-advocating factor. TNFR2 directly promotes the proliferation of some kinds of tumor cells. If you want to know more things about the role of TNFR1 and TNFR2 in TNF signaling pathway, please click here to view the full article entitled “What a paradoxical TNF signaling pathway-Based on Different Receptors”. In this article, besides the role of TNF-TNFR1 and TNF-TNFR2 intersection in TNF signaling pathway, it also compares the difference between TNFR1 and TNFR2 Signaling in Allergy. Maybe it will give your some new ideas about TNF. Additionally, a sweet guy from CUSABIO summarizes several fundamental information of TNF for someone whom is the first study on TNF, involving the function of TNF, the members of TNF family and related diseases. You can click the following link to view the full text https://www.cusabio.com/c-20601.html. 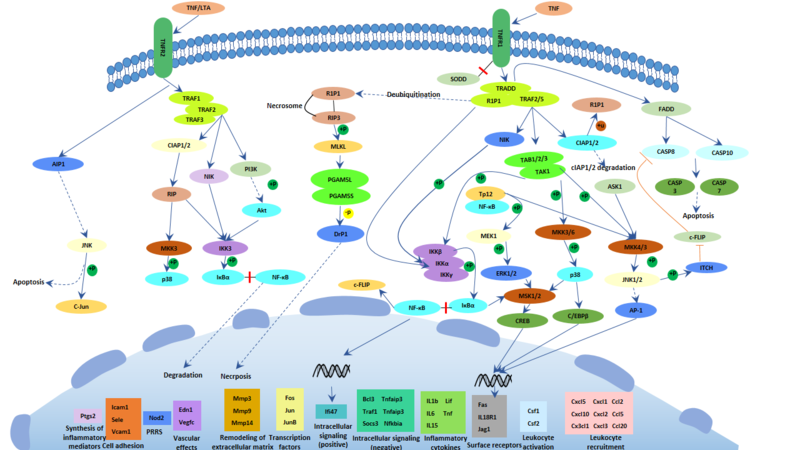 Here is the TNF signaling pathway. You can click the image to enlarge it.